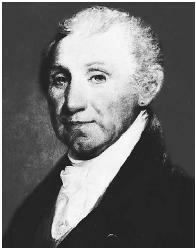 James Monroe was the fifth president of the United States and a distinguished diplomat. His administration was marked by several foreign-policy accomplishments, including the Monroe Doctrine, and a period of domestic tranquility that has been called the Era of Good Feelings. Monroe was born in Westmoreland County, Virginia, on April 28, 1758. He attended the College of William and Mary at the age of 16 but left in 1776 to fight in the Revolutionary War. He was wounded at the Battle of Trenton but served until the end of the war. During this period he became acquainted with Thomas Jefferson, then governor of Virginia. Monroe soon adopted Jefferson as his teacher and mentor, a relationship that would endure throughout Monroe's life. In 1780 Monroe began studying law with Jefferson, and in 1786 he established a law practice in Fredericksburg, Virginia. Politics, however, proved a more powerful attraction than a legal career. Monroe became a member of the Virginia House of Delegates in 1782, and from 1783 to 1786 he participated in the Continental Congress. Monroe, like Jefferson, did not favor a highly centralized federal government. He preferred a government system under the Articles of Confederation, which allocated greater powers to the states, as opposed to the Constitution, which gave the federal government more authority. He did believe in the development of the West and worked with Jefferson to enact laws to further this purpose. In 1786 he retired from Congress. In 1788 Monroe participated in the Virginia convention that ratified the new federal Constitution. He was elected to the U.S. Senate in 1790 and served until 1794. After the expiration of his senatorial term, Monroe served as minister to France. President George Washington appointed Monroe to this position despite Monroe's opposition to the Washington administration's policies. When Monroe did not follow his diplomatic instructions and made intemperate remarks about policies with which he disagreed, Washington recalled him in 1796. "Let us by all wise and constitutional measures promote intelligence among the people as the best means of preserving our liberties." Monroe quickly reentered Virginia politics. He was elected governor in 1799 and served a three-year term. In 1802 President Jefferson sent Monroe back to France as a special envoy. He and Robert R. Livingston negotiated the Louisiana Purchase from France in 1803. Following this success, Jefferson named Monroe minister to England, where he served until 1806. Again Virginia politics beckoned. Monroe served briefly as governor but left in 1811 to join the cabinet of President James Madison. He was Secretary of State from 1811 to 1817 and secretary of war, during the War of 1812 and from 1814 to 1815. The successful conclusion of the war and the military triumphs of General Andrew Jackson helped boost Monroe's popularity. In 1816 he was elected president of the United States as a member of the Democratic-Republican Party. The Federalist Party disappeared after the election, and most politicians belonged to the Democratic-Republican party. With an end to the political feuding of the early years of the Republic, Monroe was able to promote what has been called the Era of Good Feelings. His popularity was so great that he was unopposed for reelection in 1820. Monroe's presidency produced important domestic legislation, including the Missouri Compromise of 1820, which limited the extension of Slavery into new territories. His main efforts, however, were directed at foreign affairs. The Rush-Bagot Treaty, drafted in 1817, restricted the increase of armaments in the Great Lakes area. In 1818 Great Britain agreed to the forty-ninth parallel as the boundary between the United States and Canada from Lake of the Woods on the Minnesota-Ontario border as far west as the Rocky Mountains. In 1819 U.S. diplomats convinced Spain to cede Florida to the United States in return for the cancellation of $5 million in U.S. claims against Spain. In 1823 Monroe presented the most significant measure of his administration, the Monroe Doctrine. During the Napoleonic Wars, Spain had lost interest in its American colonies. Most of the colonies declared their independence, but the United States was concerned that Spain might try to reassert control. The Monroe Doctrine declared that the Western Hemisphere was closed to further European colonization and that any European intervention would be regarded as a threat to the security of the United States. Conversely, the United States agreed not to intervene in European matters. The Monroe Doctrine would be invoked several times by future presidential administrations. After leaving the presidency in 1824, Monroe retired to Oak Hill, his estate in Virginia that was near Jefferson's Monticello. He served as a regent of the University of Virginia and in 1829 presided over the Virginia Constitutional Convention. Monroe's last years were difficult. He left public service a poor man and was too old to rebuild his law practice. He was forced to sell his home and move to New York City to live with his daughter. He died there on July 4, 1831. Ammon, Harry. 1971. James Monroe: The Quest for National Identity. New York: McGraw-Hill. Wilmerding, Lucius. 1960. James Monroe: Public Claimant. New Brunswick, NJ: Rutgers Univ. Press. Missouri Compromise of 1820; Monroe Doctrine; "Monroe Doctrine" (Appendix, Primary Document). The first was Maria Hester Monroe, James Monroe's 17-year-old daughter, in 1820; the last was Tricia Nixon in the Rose Garden in June 1971. A host of huge US stars have done their bit for troops over the years, including Bob Hope, Betty Grable, Marilyn Monroe, James Stewart, Bing Crosby, James Cagney, Marlene Dietrich and Humphrey Bogart. Once worn by Marilyn Monroe, James Dean and model Cindy Crawford, Levi's 501s have been an indispensable fashion item for most of their 120-year history but, like most other denim jean brands, have suffered from the general dumbing-down of the image of jeans now being sported by the likes of Des O'Connor, Camilla Parker Bowles and Tony Blair. If Elvis Presley, Marilyn Monroe, James Dean, movie monsters and Looney Toons characters rate a commemorative stamp, they contend. Gloria Steinem wrote on Jacqueline Kennedy, Norman Mailer on Marilyn Monroe, James Baldwin on Malcolm X, Gay Talese on Joe Dimaggio. I'm sure Marilyn Monroe, James Dean and even Roy Rogers will make an appearance. In "the coolest club", citizens of the underworld include Marilyn Monroe, James Dean and Kurt Cobain, as well as telesales people who ring up humans on the other side to ask banal questions.